Have you ever seen this pair of shoes before? You have probably seen them in Japanese movies, animations and dramas. These clog-like slippers are known as “geta”. It sometimes also makes a sound similar to that of a clog. Let’s get to know more about Geta. 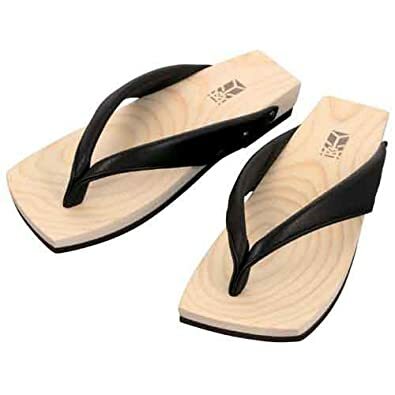 Traditionally speaking, getas are usually made of wood with thongs (hanao). However, the thongs are replaceable. Remember that these traditional slippers are mostly worn during special events or ceremonies but can also be worn during informal ones. Thus, there’s no need to use socks. Contemporary designs for daily use are also available nowadays such as the ones in the picture for men. If you would like to purchase such pair of slippers, you can find it on Amazon. The two pieces which support the base board of the slippers are called ha. Some slippers only have one while others have two. Have you ever wondered why the platforms are so tall unlike modern slippers? Since geta is used for formal and informal ceremonies, the wearers will have to wear an expensive kimono or yukata. They just don’t want mud to get on their clothes! Who woul want that? For those who want to do cosplay, it is now easy to find geta-inspired slippers in the numerous stores in Japan. You can also choose the design you like. Thong-designs come in different colors and prints as well. The one above is a very modern version. These are said to be comfortable and generally good for health. Women who would love to wear kimono in a casual attire can use these sandals. Kids nowadays are very fashion-forward. Do you know that they can also wear a modern pair of geta? Here are some pretty contemporary geta for children. They are best to pair with modern yukata-dress!